On six Saturdays every academic year, throngs of local students and their parents head up Science Hill and congregate on the second floor of Sterling Chemistry Lab. For the first hour, Yale undergraduate and graduate students give hands-on demonstrations on a variety of scientific principles. The crowd then flows into a lecture hall for an hour-long presentation by one of Yale’s many renowned faculty. Undergraduate volunteer Emma Graham shows attendees an apparatus that detects ionizing radiation. Photo by Suryabrata Dutta. Science on Saturdays is a joint venture presented by the Yale Scientific Magazine (YSM) and hosted by Kurt Zilm, professor of chemistry and chemical engineering. 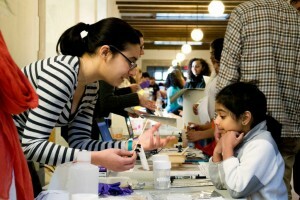 Organized by Yale Synapse, YSM’s outreach group, and Yale Pathways to Science, these events offer the general public a unique experience. “The kids really love it and so do we. It’s wonderful to do outreach in such a tangible way,” said Kevin Hwang, director of Synapse. 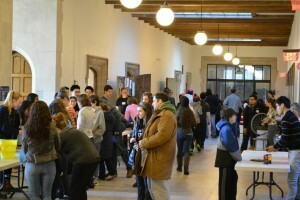 Parents and students crowd the second floor of Sterling Chemistry Lab for the January 31 Science on Saturdays event. Photo by Suryabrata Dutta. The most recent Science on Saturdays event, held on January 31, featured Stefan Simon, Director of the Yale Institute for the Preservation of Cultural Heritage. Simon presented a lecture on how forensic analysis is used to identify art fraud. As an expert conservation specialist, he explained how he uses technology and chemistry to examine pieces of art and to pinpoint fakes. Outside of the lecture hall, Simon’s colleague Aniko Bezur ran two demonstrations. The first was about the separation of components of a pigment, known as chromatography. The second made use of camera filters to see the preliminary carbon sketches of old paintings. An undergraduate volunteer explains how different components of pigments can be chemically separated. Photo by Suryabrata Dutta. For 10 years, the Science on Saturdays program has given community members insight into the life of Yale faculty and undergraduates. Previous presentations have spanned topics from “Why Birds Are Dinosaurs” to “The Universe in Your Hands.” As the program expands, Zilm hopes to diversify demonstration content and to broaden Science on Saturdays’ audience. “What we have is great, but I would love to have a stronger presence online so we can reach more people,” Zilm said. Already a great resource for local residents, the hope is that Science on Saturdays will soon be more widely available. The remaining Science on Saturdays events this semester will be held on February 28 and March 28. 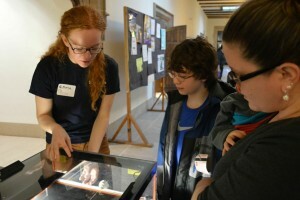 For more information, please visit http://onhsa.yale.edu/science-saturdays.